Wheat berries are short, plump whole-wheat kernels loaded with nutrients. Eating grains in their whole form allows you to get all the nutrients that you miss when the grains are processed into bread, pasta, and pastries. Wheat berries are rich in fiber, with 4 grams in a ½-cup cooked portion; a good source of protein with 6 grams per serving; and low in fat with 1 gram per serving. Wheat berries are energizing, and don't make you feel tired, bloated and sluggish like many breakfast bowls of cereal do. 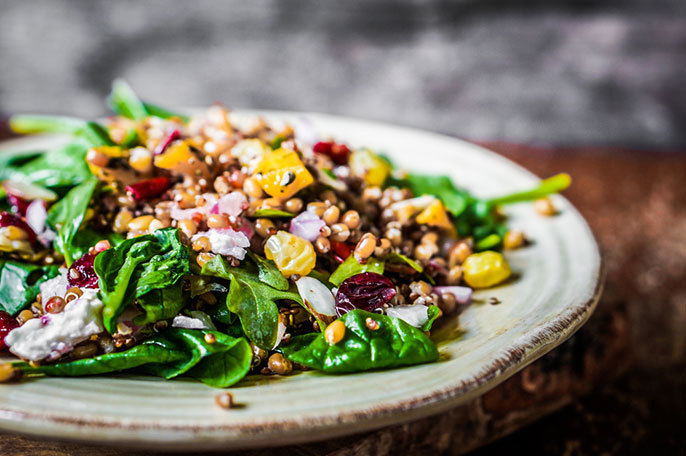 Grain salads are easy to make ahead of time, and unlike greens, which can get soggy, they only benefit from soaking in their dressing. By using the intact wheat kernel, or berry, you'll reap the full nutritional benefit, as well as the pleasantly nutty taste. When cooked up in milk, wheat berries make a hearty, very nutritious whole-grain breakfast porridge. They also add very tasty extra nutrition when blended into muffins, salads, soups, and stews.